verse encourages readers to grab handfuls of Teddy Bear counters for a variety of activities. Even if you do not have a classroom set of the commercially available bear counters this book is a great addition to your classroom library. 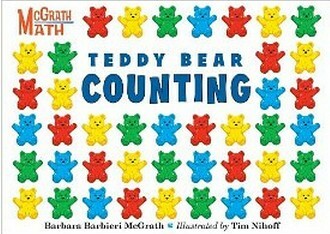 An earlier book by McGrath, Teddy Bear Counting is a perfect companion to the new title. Together, the two books help children build Number Sense and develop counting skills. Aside | This entry was posted in counting, Graphing, Manipulatives, Number Concepts, Number Sense. Bookmark the permalink.